We took a bit of a break but we are back with more in depth ebook reader reviews coming very soon. To kick things off we have just updated our 6″ ebook reader comparison table with all the major ebook readers launched in 2012 and 2013 which are now available in the UK. This is the most comprehensive comparison table available online, and will help you differenciate the key players this year. We have kept the old models there for comparison’s sake in a table below. 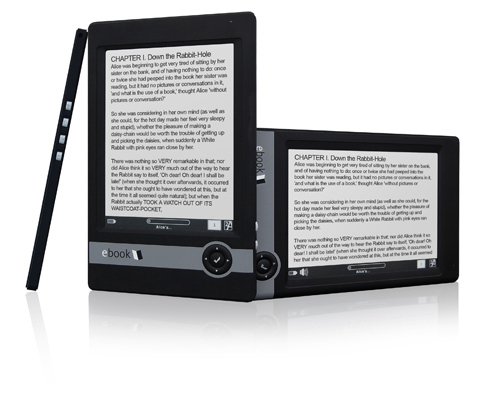 Click here to check out our 6″ ebook reader comparison table. Amazon today released details of its new line of Amazon Kindle devices which are now available to pre-order (dispatch of the new ebook readers will start on the 27th August in the UK & US). 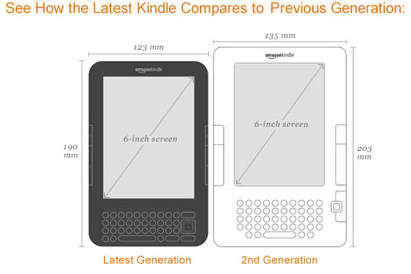 Two new Amazon Kindles are coming (A Wifi only and Wifi & 3G version), which will replace the Kindle 2. 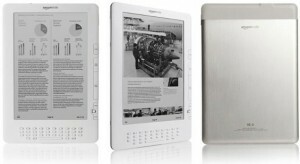 The new devices are smaller, lighter, and now much more affordable which should help drive the demand in ebooks. -Now available in graphite colour! Also the great news is that a UK centric Amazon ebook store is coming on the 27th August, as you now have to purchase from the US website at the moment. I’m not too sure how Amazon can make this work financially, but its great news for book readers – As ebook readers are now much more accessible, and perfect for everyday use – Much better than Ipads and colour tablets when it comes to reading books, and now much cheaper. The Kindle Wifi will retail at £109 ($139) , and the Wifi + 3G Kindle will retail at £149 ($189), and you can click here to pre-order yours for dispatch as soon as it comes out. Pre Order Your New UK Amazon Kindleor Pre Order your New USA Amazon Kindle. Will The iPad iBooks Kill The Ebook Reader? In typical Apple fashion, the iPad has generated a huge amount of interest. Steve Jobs has described the device as “magical”, “extraordinary” and sees the device as redefining the personal computer. This tablet type device launches on the 3rd of April in the US, and will hit the UK at the end of April. Featuring a glossy 9.7” LED, touch screen, the device which resembles a large Iphone will support email, web browsing, all the main features (except the phone bit) of the Iphone as well as an eBook reader built in. But is it an eBook reader killer? Add to these the fact that you can use your eBook reader as a note taking device, you can annotate text, and on some readers actually listen to music or audio books on the go. How does the iPad compare? The iPad has 10 hours of battery life which is great, but simply cannot compare to 2+ weeks of use on standard ebook readers. If you travel a lot this will be a huge issue. 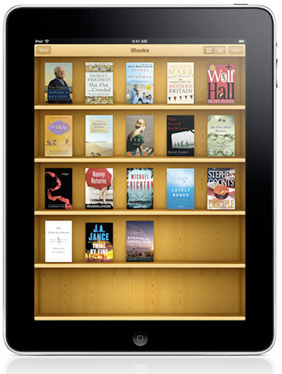 The iPad comes with an improved Itunes which will include an ebook store. Although you won’t get as many ebooks as say on Amazon or Borders, you will be able to purchase eBooks on the go. You can import any unlocked (non DRM) epub ebooks into your iPad through Itunes but you can’t read your ibooks from any other device then the iPad. Price wise, the iPad will start at $499, which is much more expensive than most ebook readers out there, but in line witht the pricing of the Kindle DX. The iPad also innovates by providing interactive magazine content and tailored news content which mixes text and multimedia. So is the iPad the next eBook reader? We don’t think so yet, but its definitely going to be a key player, and Amazon definitely acknowledges that by releasing a Kindle App for the iPad. If you are a keen book reader, and you like having your books with you when travelling there is no better device than an E-Ink eBook reader. You won’t get eye fatigue, you will be able to read indoors and outdoors and you will be able to read for weeks without having to recharge the device. But the iPad will change the landscape of eBook readers. The start of a revolution? So the iPad isn’t yet an EBook Reader Killer, but it is an impressive device which will force many eBook reader companies to push more innovative features. Thats right folks the long awaited update to the Bebook One is finaly going to be released on the 14th of October 2009 during the Frankfurter Buchmesse (Frankfurt Book Fair). If you happen to be in the area, you can find the BeBook booth at hall 4.2, booth 450. If you have been holding off from buying an Ebook Reader, now is the time – With great offerings from the likes of Bebook, Sony, Amazon, Cybook, and Irex you are spoilt for choice. We haven’t managed to get our hands on a Bebook 2 yet, but from the information provided by the guys behind Bebook it sounds like a really good candidate for the top ebook reader slot in Europe. We’ll update you as more details come in. Update: No sign of a release I’m afraid 🙁 Sounds like the BeBook team is busy with the post Bookfair work. 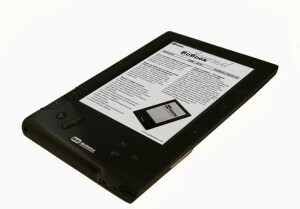 Borders UK is looking to rival Amazon by beating them to a UK launch, with their unveiled Elonex ebook reader. This new ebook reader was launched nationwide in UK Borders stores at a £189 – Much cheaper than the the iRex iLiad, priced at £399, which they will continue to sell alongside the Elonex. The Elonex eBook is compatible with the free Adobe Digital Editions software, and is one of the first ebook readers to market with this technology and supports DRM protected reflowable PDF and ePub formats, as well as other less widespread eBook formats and images/pictures. This puts the Elonex closer to the Bebook beating the Sony Ebook reader in terms of ebook formats, but doesn’t quite match the wide range of ebook formats available for the Bebook. The ebook features a 6 inch e-ink screen, and at 9mm thick and only 180g it’s incredibly thin and light – And the long battery life means you can enjoy up to 8000 pages between charges. The new device comes with 100 titles already pre-loaded and can hold up to 1,000 books (8000 with the optional 4gb SD card). The device was launched into the 41 Borders stores and 10 Books Etc and Borders Express branches on the 30th June. Customers will be able to take advantage of the 45,000 ebook library available on the Borders UK website, which are all going to be compatible with the device to maximise readability – Plus the many more available in epub format. Click here to see the range of ebooks available at Borders. 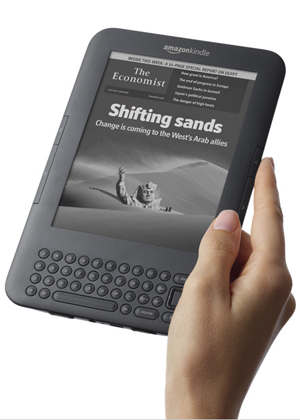 The Elonex eReader is now available online at the Borders website,click here to find out more. Is this the Amazon Kindle 2 ebook reader? Our friends over the Atlantic over at BGR have uncovered what appears to be Amazon’s Kindle 2 ebook reader. Although we are suspicious, the picture does look authentic, and if this is true this could be the follow up to their very popular ebook reader. Unfortunately for us in the UK, Amazon has yet to release any Kindles over to Britain or anywhere else than the US so far. Looking at the photos of the new Amazon Kindle 2 e-book we are impressed, although the unit hasn’t gone down in size it looks much cleaner and neater than the current model. This is very much in line to its close competitors including the awesome Sony Ebook readers. The unit now has a joystick, and the following buttons: Home, Next Page, Menu, a joystick, and Undo. On the left side, there’s Previous, Page, and Next Page. The keyboard of the new Amazon Kindle device has been redesigned and we are impressed by its good layout, but lettering on the keys could be better. Looks like they no longer have their own charger. The Kindle 2 is able to be charged with a miniUSB cable which sounds like good news for the travellers in us! 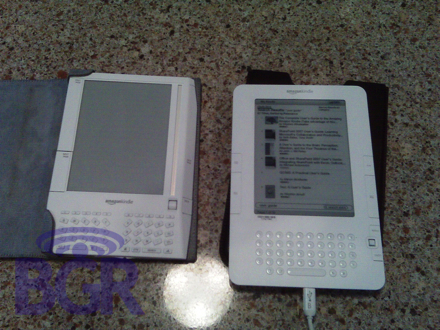 The display is roughly the exact same as the original Kindle even though at first glance it might appear a bit smaller due to the new shape. © 2008-2019 Ebook Readers Review. All rights reserved.